I am quite opinionated about Street Photography! But don’t worry, we’ll save that one for another day! One of the things that greatly appeals to me about ‘Street’ is that it offers the opportunity to capture moments of life that are unique, that’s not to say that all street shots are vastly different from one another, of course not, but like snowflakes, each street shot will show little differences to other shots and this appeals to me. 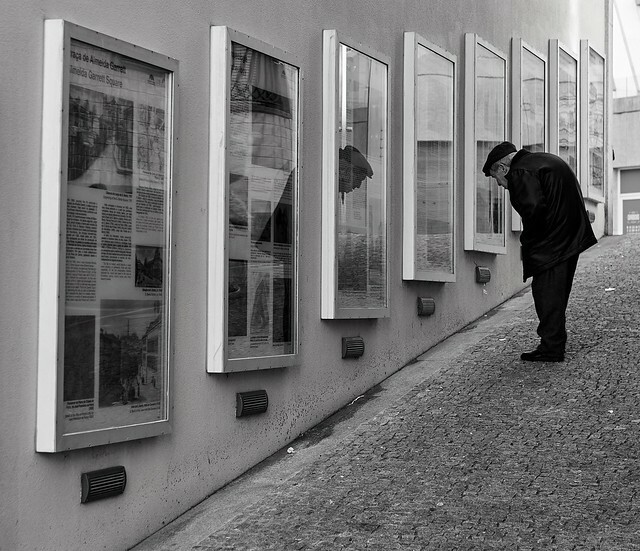 I’m pleased with how this one turned out (which shouldn’t be a surprise, seeing as I’ve put it on the blog) and I hope that you like it too.. It’s just an everyday scene, a man reading a poster. But hopefully you can appreciate the angle of the hill, the repetition of the shapes and the use of reflection. You might even speculate on what exactly it is that he’s reading? Little moments like this are all around you, scenes that lend themselves to photography, you just have to look out for them.